Annika pilots Game Over, her giant mechanical fighting machine. Annika O’Brien works full time making cool robots. She also founded the popular LA Robotics Club, which has over 1,200 members including high school students, hobbyists, and professionals who share an interest in building robots. The club meets in real space to work on projects and participate in presentations, as well as holds classes as part of their community outreach to under-served teens. Annika’s boundless enthusiasm and outspoken demeanor jumped right through the screen at me as we met via video chat to discuss her experience on SyFy’s ground breaking show, Robot Combat League, where teams control giant humanoid robots duking it out in an arena. Contestants were paired in teams and assigned one of twelve robots. The robots were designed and created by Mark Setrakian and his team. Annika says she really enjoyed working with him. “Mark was awesome. He designed those robots. Not all by himself; there were a lot of people involved. But after meeting him, I don’t know of another person who could have pulled it off like he did. I think they got the perfect guy. He’s got that evil genius kinda thing going for him too,” Annika laughed. Annika and her teammate Keisha Howard were assigned the robot Game Over, a heavily armored monster with good mobility. Keisha, a gaming and geek culture enthusiast and founder of Sugar Gamers, was the ‘jockey’, who controls the upper body and arms. Annika was the ‘tech’, who drives the robot. The two team members needed to work in perfect concert to make the robot move and fight effectively. Game Over glares out at his opponents with a 24″ monitor embedded in his torso. What was it like controlling a giant fighting robot? We discussed some of the weak points of the robots. The six hydraulic actuators in the abdomen were susceptible to damage. If one or two of them were destroyed, the additional forces on the remaining ones could cause a total failure. Training for the show was serious business. Controlling these massive machines takes practice. Annika asked a lot of questions during training. She wanted to know just how these robots worked. Each fight consisted of three two-minute rounds. Many of the fights didn’t make it to the third round. The damage these robots dished out is hard to appreciate. Annika was surprised by the shear size of the robots. Between rounds, each team had 20 minutes to make any repairs and be ready to fight again. The teams had help from a pit crew, but all the major calls for fixing the robots were their own. Game Over fought A.X.E. in the third episode. Team A.X.E. consisted of jockey Andrew Montanez (a mixed martial artist) and Ross Mead (a computer science PhD research fellow at USC). Game Over towered over the shorter A.X.E. and had a longer reach, but A.X.E. was heavier. Annika told me part of their strategy was to use their robot’s longer arms to hold A.X.E. out of striking distance. 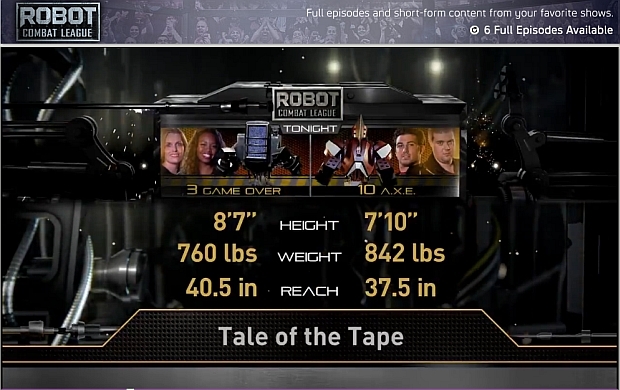 Robot Stats: Who has the advantage? About half way through the first round, Game Over’s left arm was damaged, and it began leaking hydraulic fluid. The sight of robots spewing their precious fluids was a common occurrence on the show. The fluid not only powers the robots’ actuators, it is super slippery and affects their traction. Annika and Keisha continued to fight on despite their broken arm. Keisha rained blows upon her opponent and A.X.E.’s left shoulder armor went flying across the ring, leaving the arm’s actuators exposed. But then A.X.E. scored some more damage on Game Over, affecting the right arm. As the round one bell sounded, the announcers and the other contestants seemed to agree that Game Over had taken the brunt of the damage as more hydraulic fluid leaked onto the floor. Game Over and A.X.E. face off in Round One. Annika, Keisha, and their pit crew worked furiously to repair their robot’s right arm, and they continued into the second round. Both robots hammered away at each other. A.X.E. dished out more damage to Game Over’s right arm, but it continued to function. The crowed shouted in wild excitement when Keisha managed to knock A.X.E.’s actuated head clean off! Of course, since there was no brain inside the robot’s head, A.X.E. was able to keep fighting. As the second round ended, onlookers felt that Game Over might make a come back. However, the robot was badly damaged. They were basically down to one elbow actuator still functioning on one arm. Annika, Keisha and Mark discuss whether Game Over can keep fighting. Annika and Keisha’s fight was the first one on the show to go all three rounds. Despite managing a pretty effective fight in the third round, the bout went to A.X.E. Annika and Keisha’s loss meant they had to leave the show, but they had put up a really good fight. Annika was very positive about her involvement. She stressed the feeling of community on the show. From the other contestants to the robot crews to the film crew, everyone was great to work with. Annika told me she enjoyed speaking with the people who built and maintained the robots. They were really knowledgeable and they knew these robots inside and out. Their expertise impressed Annika. “The people who were in charge of the robots were amazing to work with. Every day I just enjoyed the people I was around. This guy totally out-nerds me,” Annika thought about one robot crew member in particular. 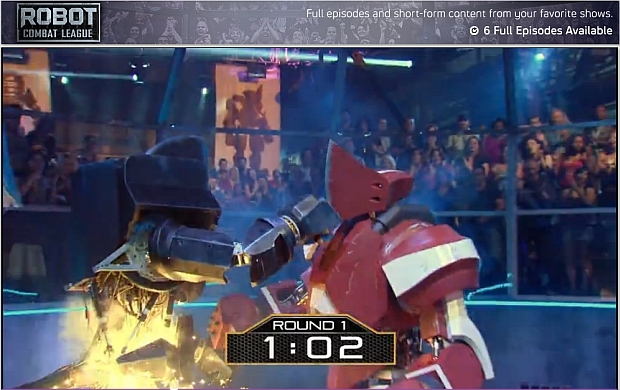 SyFy hasn’t announced yet if there will be a second season of Robot Combat League. “I would do it again if they called me,” Annika assured me. Despite having such a positive experience, there was one dark cloud over the show for Annika. The reaction some of the women on the show received around the internet was troubling. Some people posted some very negative things that simply were not true, and it angered her. So what’s next for Annika? She’ll be a speaker on the Arduino panel at Bay Con later this May. She also hinted that she’s got something big coming up, but she’s not free to share the details yet. Editor’s Note: Mark Setrakian will be presenting an inside look at the background, development, and creation of the fighting robots of Syfy’s Robot Combat League at Maker Faire Bay Area this year. Don’t miss it!